You’re probably thinking that a cemetery hardly sticks to the mission of getting outside. I mean, it’s outside. And Arlington is, in fact, a National Park. But it’s not … well … you know. Arlington is special because of the people we know who are now resting there forever. The cemetery also happens to be gorgeous — I mean really, just beautiful. The streets are lined with aged, stoic trees. Some of the older graves rest beneath splayed limbs. Up, up, up the hill stands first the Tomb of the Unknowns and Gen. Robert E. Lee’s Arlington House. From the steps of Arlington House visitors can see this view down onto the cemetery and out over Washington, D.C.
We first started visiting Arlington and the guys of 1-17 Infantry Battalion, 5th Brigade of the 2nd Infantry Division (Strkyer) from Fort Lewis, Washington (or “1-17 IN BN, 5-2 ID” as they say in Army language) in 2010. A little tag marked where seven who were killed by the same improvised explosive devise are buried and later received a large stone. Others lay under their own stones — four stones in all plus a spot in the nearby mausoleum. 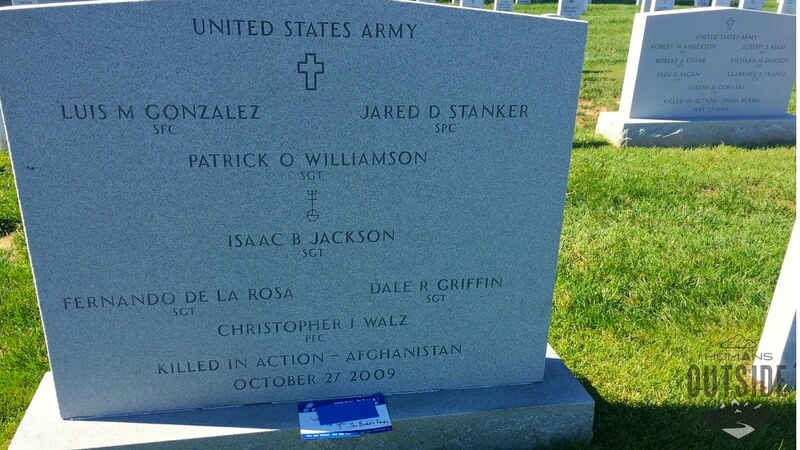 These seven men were killed together during That Deployment. At one point only a small tag marked this spot while their stone was being created. 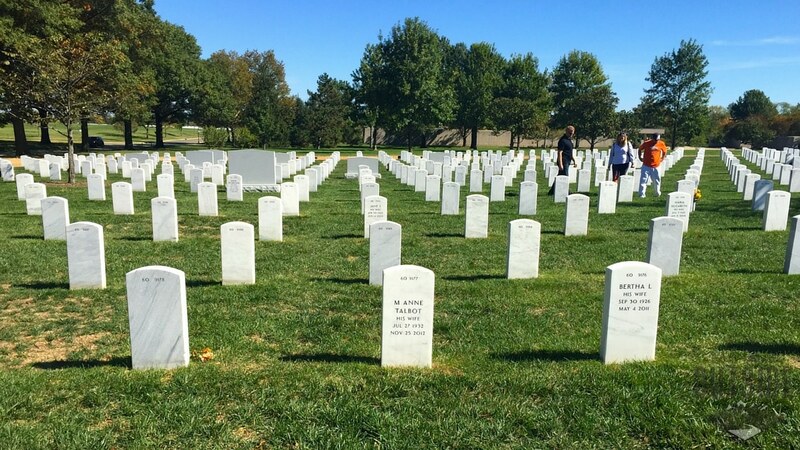 The guys were all buried on the edge of Section 60 — the grass stopped after their gravestones and the knowledge that new grass could be planted, that there was always room for more war loss in the dirt of Arlington, hung heavy in the air. In 2010 I could gauge the guys’ location and easily find them based on the grass’s edge. Now when I visit Arlington, rows and rows and rows of graves sandwich Our Guys between more war loss and deceased veterans. To find them I have to do a little heartbreaking hunting. The view now from one of the gravesites where one of our guys rests. If you’re visiting Arlington you probably are either in between other stops or looking for a very specific gravesite. You may be trying to get to a Changing of the Guard at the Tomb of the Unknowns. You may have wildly underestimated just how much walking it was going to take and so you’re running late. But rushing yourself while at Arlington goes against the tone of reflection that Arlington strikes. And so I recommend that you take note of a few tips if you’re planning a visit. Here they are. 1. Plan your entrance strategy. There are three ways you can get into Arlington National Cemetery. You can take the Metro, you can park in the garage or, if you’re a military ID card holder, you can park on Fort Myer which has a parking lot right outside a walk-in gate at the top of the hill just above the Arlington House and book shop. My suggestion? If you can and you’re not headed just for a gravesite in Section 60 (which is where those killed in the wars in Iraq and Afghanistan are buried), and don’t want to visit the main visitor’s center, park on Fort Myer. 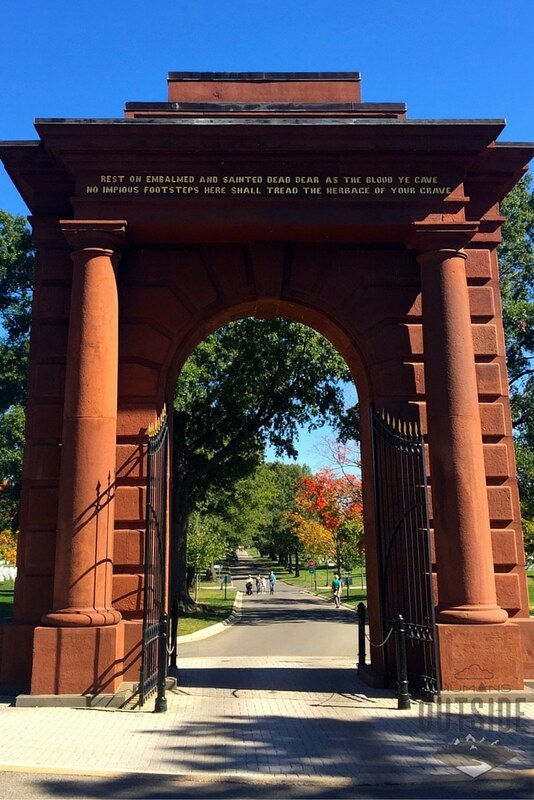 The walk takes you past the oldest graves and right by the Arlington House, down past the entrance to the Tomb of the Unknowns and down through the McClellan Arch (the original public entrance to the cemetery). It’s a beautiful walk. The McClellan Arch on a beautiful October day. The next best way to come is by car to the main parking garage. Parking is easy. From the parking garage you enter near the visitor’s center at the bottom of the cemetery. From there it is about a 10 minute walk to Section 60. The Metro entrance is not far, either — but since traffic is not an issue and parking is easy, I prefer to drive. 2. Know where you’re going. You can hit the visitor’s center at the main Arlington entrance and look up the location of any service members whose graves you wish to visit as well as pick-up a map and look up any other information. Or. You can download the ANC Explorer app and use it on the go while you explore the park. It’s easy to get and use. I highly recommend it. 3. This is the most important tip: take your time. Every single time I visit Arlington I have less time than I hoped I would. Every. Single. Time. And so here is my top suggestion about visiting Arlington National Cemetery: take. your. time. Give yourself a few hours to walk through the park and reflect on what those stones and trees and memorials mean. 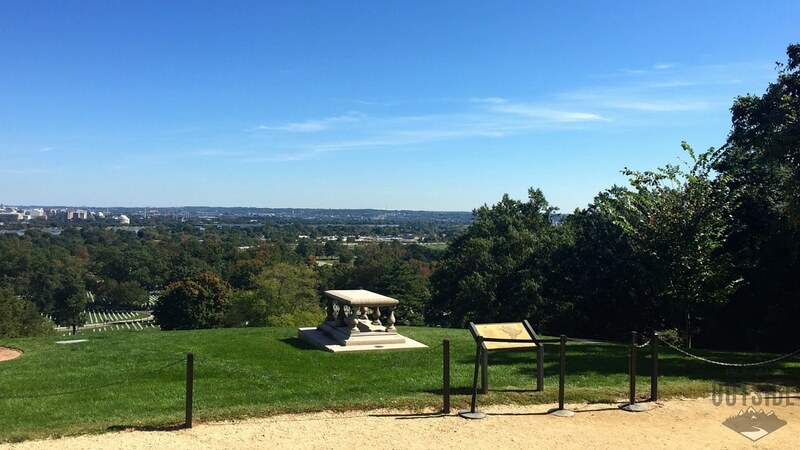 Visit Arlington House, listen to the tour, get your stamps (at the visitor center and in the Arlington House book shop on top of the hill), and pause for a few minutes at a gravesite in Section 60. Note how the leaves glide to the ground in the fall, how the buds burst in the spring, how the snow crunches under your step in the winter, how everything seems to steam in the summer. Think about the sacred ground around that houses so many heroes lost while their work here on earth was just getting started. Think about the families left behind. Go outside and honor the space where they now rest forever. What a moving description. I have a number of brothers and sisters (both the military kind and the family kind) buried at Arlington. You never have enough time to take it all in, and I can never stay as long as I want. Someday I’ll be there myself.